“Strange Hobby” is a collection of Arjen’s recorded versions of songs that have influenced his musical development. To make the album even more “strange,” the booklet contained no information about who was responsible for the recordings. The album, mastered at Abbey Road Studios, was a complete mystery. As Arjen explains, “From the start I intended to keep it a secret, who made this album. 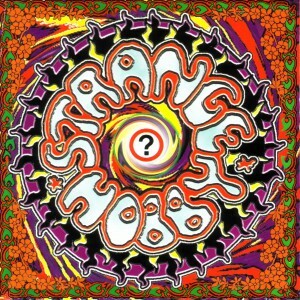 I just wanted to do that…it may not be smart from a commercial point of view, but it was fun.” Strange Hobby was released in 1996 by Transmission records. The original release is out of print, it is now considered a collector’s item. The album was recently re-released on a new label, and is available here. The interview below is from De Telegraaf, and was published in 1996 when the album was released. What do you mean, ‘Strange Hobby’? Is it strange for a musician to record the music that once influenced his music and that still has a place in his heart? Still, Arjen Lucassen named his side project ‘Strange Hobby’ and to make it even more strange; the booklet didn’t say who was responsible for the disc. The album mastered at Abbey Road Studios was a comply mystery, with the crème of rock and surprising arrangements. In the end former Vengeance-guitar player Arjen Lucassen appeared to be responsible for this album. After the break-up of his once very successful hardrock band he came up with the Ayreon project, rock-opera’s (‘The Final Experiment’ and ‘Actual Fantasy’) in their purest form. The guitar player has been so driven, that he didn’t realise that he might have overdone it. Song after song has been recorded perfectly, and that 18 times! “This might be my only disadvantage,” he confesses, “when I’m making music I don’t know how to slow down. Besides, you shouldn’t forget that songs in those days normally had a duration of about two minutes. I couldn’t make an album with only ten songs in this case….”. Unfortunately this album went of out print a few years ago. It is now a collector’s item. You may be able to find copies on the internet through the auction sites like eBay.